Easter, of course, is about rebirth. About rolling the stone away and finding new, uplifted life. I won't belabor the metaphor, but on some level it works for where I was at last night. As the day drew to a dreary close after various rain showers and even a spattering of hail, I didn't feel like going out. I wanted to stay home and curl up with a book, warm and comfortable. Yet, there was this group called Brass Menazeri in town from the Bay Area. 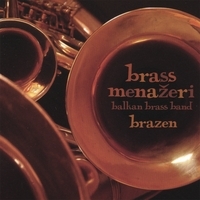 I'd been playing their CD, and greatly enjoying their take on Balkan and Romani brass music. So I dragged myself downtown and into the icebox of Art House Designs, where a smattering of people lined the walls around the open floor, and a few people wandered around carrying various windings of shiny metal tubes. I love live music. And just being there made me feel more energized. It didn't hurt when I found out that members of this band have ties to other groups I enjoy, including the women's vocal ensemble Kitka and the crazy gamelan-Afrobeat mashup known as Gamelan X. And then, my friends, the music started. A blast of horns that varied but barely paused as the nine-piece band ran through a playlist of songs from Serbia, Bosnia, even Bollywood. Squeaky-tight arrangements, great solos, and best of all the band was having as much fun as the audience. The band deserved a much larger audience, and they get kudos for giving it their all despite the sparse turnout. It was their first show in Olympia, part of their first Northwest tour. Still to come are shows in Seattle, Port Townsend, Portland, Eugene, and Arcata. Friends, I implore you: If you have any reasonable proximity to one of their shows, don't hesitate. Get thee hence, preferably with a group of dance-happy friends. Or friends who need a resurrection from their home-bound lethargy. Here's a little taste from their CD Brazen. They are working on another CD that they expect to release late this year. This has been a brass-heavy week, with KAOS radio appearances by both the Hungry March Band and Orkestar Zirkonium. I did not, by the way, make it to Honk! Fest West this weekend, much to my dismay. Events conspired to keep me away, but I hear some pretty convincing rumors that it went well (with brass bands playing in the streets until the wee hours of the morning) and that it will repeat next year.